Like the late Victorian villas around, the church is built of red brick. According to an inscription, it was built in 1890-91 at the cost of Elizabeth Mason, in memory of her husband. It is in Sir A W Blomfield’s (GRI) economical mode, with no obvious provision for a tower though one is said to have been intended (1). 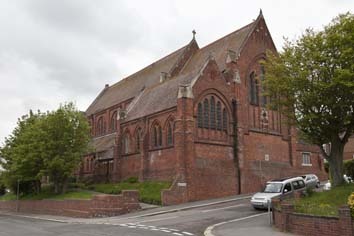 Possibly it would have been perched on the structure, as at Blomfield’s Christ Church, London Road, St Leonards in the town. 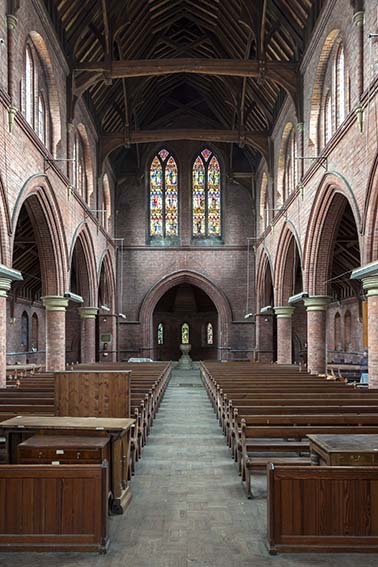 Most windows are lancets, grouped in the aisles, east end and clerestory and the only variation is Y-tracery in the lower side windows of the east end and chapel. At the west end an apsidal baptistery projects, as in so many of Blomfield’s churches. Inside, everything is brick except the abaci of the piers. Nave and chancel are almost equal in height, with a tall, inconspicuous arch between. A further arch encloses the east end, another favourite device of Blomfield. Each clerestory window is shafted and as in so many of his churches, the carpentry of the roof is of fine quality with cusping. Following structural problems and a declining congregation, the church was made redundant in 2008, when the parish was merged with that of Christ Church, Ore. 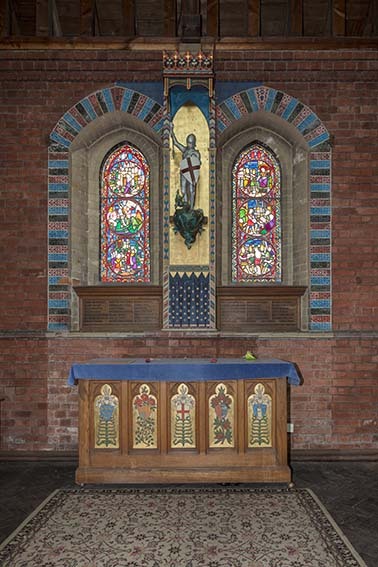 Uncertainty continues and in 2014 the Victorian Society listed the church among its ten most endangered buildings. Four years later (2018) the situation was unchanged and it remains up for sale, whether freehold or leasehold. 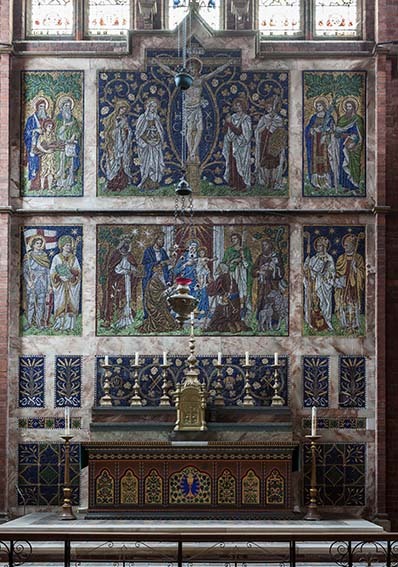 Altar: (North aisle) P W Cole, assisted by his students at the Hastings School of Art, 1923, including the surrounding decoration (BE(E) p ibid). Font: A circular bowl of streaked marble, resting on short columns of a darker stone. 1. 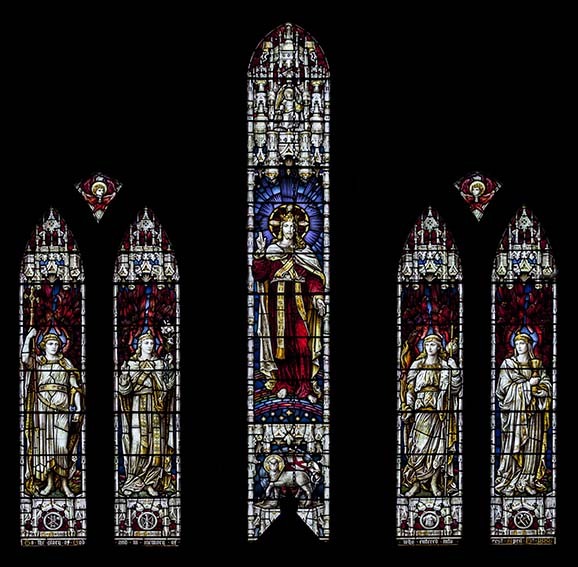 (East window and south aisle seventh and eighth windows) Heaton, Butler and Bayne. 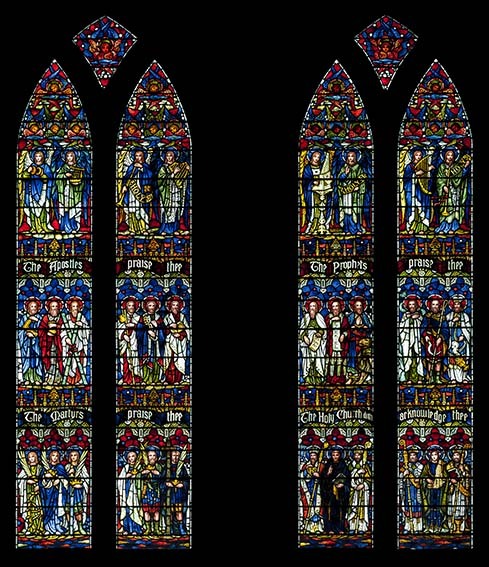 The east window (1888) depicts Christ the King, flanked by saints. 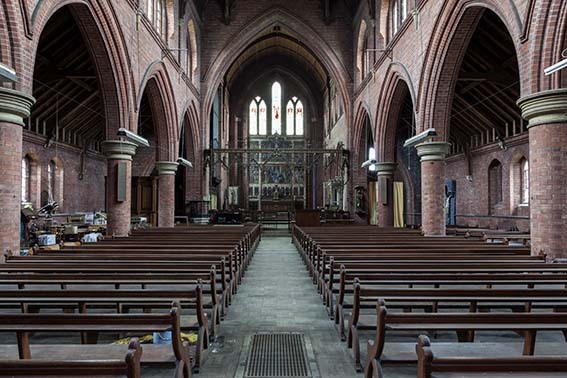 Those in the south aisle probably date from c1897, though the date of 1893 has also been given (BE(E) ibid). They are derived from famous paintings including Holman Hunt’s Light of the World. One or more of these (or the baptistery window below) is likely to be the additional glass by the company recorded in its own catalogue of 1902 (Bayne p126). 2. 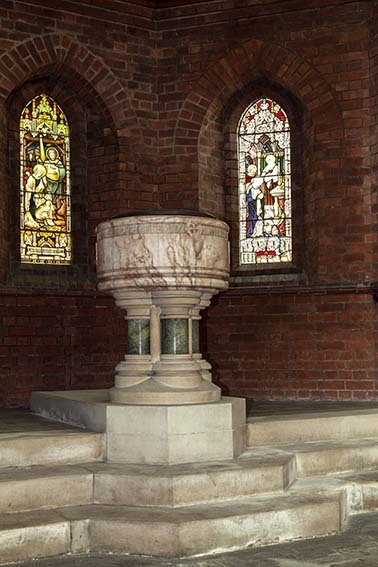 (Baptistery, centre window) Heaton, Butler and Bayne, 1892-93 (1). 2. (West window) J Powell and Sons, 1908 (Order book). The Te Deum is depicted. The designer was C Hardgrave (1). 3. (South chapel, fourth window) Shrigley and Hunt, 1893 (www.stainedglassrecords.org retrieved 4/3/2013). Delicately drawn figures in a late Pre-Raphaelite idiom. 4. 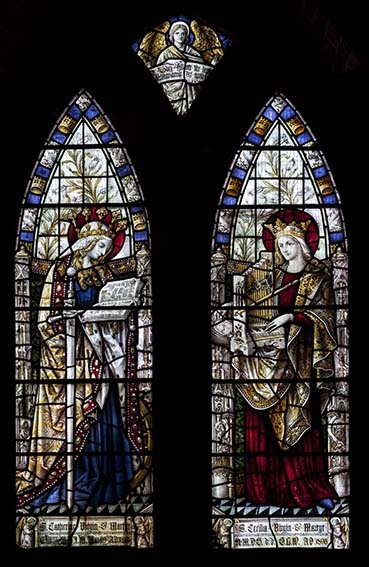 (North aisle, seventh and eighth windows) Saints by P Bacon, 1905 (one signed). The heads are curiously photographic in appearance, as if portraits of actual persons. 5. (War Memorial Chapel) Two lights by P W Cole, 1934 (Dated) (1). They are in the idiom of early mediaeval glass with three small-scale medallions. Reredos: Marble and mosaic and tall. It is by J Powell and Sons and dates from 1897 (BE(E) ibid). 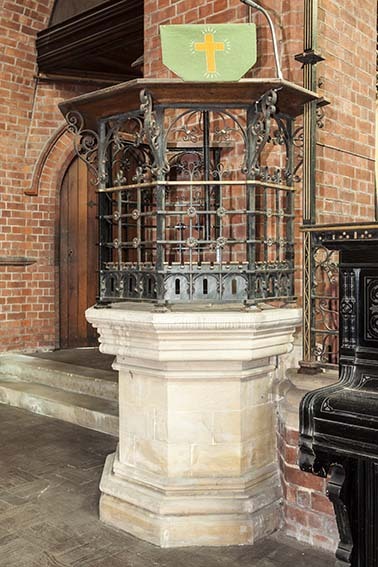 Screen: Open ironwork and incorporating the pulpit and lectern, of a type favoured by Blomfield. 1. Notes on the history, glass and fittings by John Barber, made available through Nick Wiseman. My thanks to Nick Wiseman for the photographs. In view of the uncertainty that currently surrounds the survival of this church, I have used more than the usual amount.